Black soybeans are merely a black variety of the soybean. It is a rare legume native to China and has been used in Chinese medicine to clear toxins from the body. As with the yellow soybean, the black variety is considered an inexpensive source of protein. The black soybean is grown to be eaten as it is, similarly to other legumes, either dried and reconstituted in water or used simply from the can. Most health food stores carry canned organic black soybeans. The most common brand is Eden Foods. Their black soybeans are organic, non-GMO, and come in BPA-free cans. Dry black soybeans are harder to find, but some stores carry them. Nutritionally, black soybeans are very similar to regular yellow soybeans—free of fat and a good source of protein. They are low in net carbohydrates (the amount of carbohydrates per serving minus the grams of fiber) and high in protein, fiber, vitamin K, iron, magnesium, copper, manganese, and riboflavin. Half a cup of canned black soybeans has 1 gram net carb plus 7 grams of fiber (8 grams of total carbohydrate), 11 grams of protein, and 120 calories. The black variety is higher in some phytonutrients, including antioxidants. The only distinction between white and black soybeans is the color of the hull, so any nutritional difference will be found in the black outer shell. 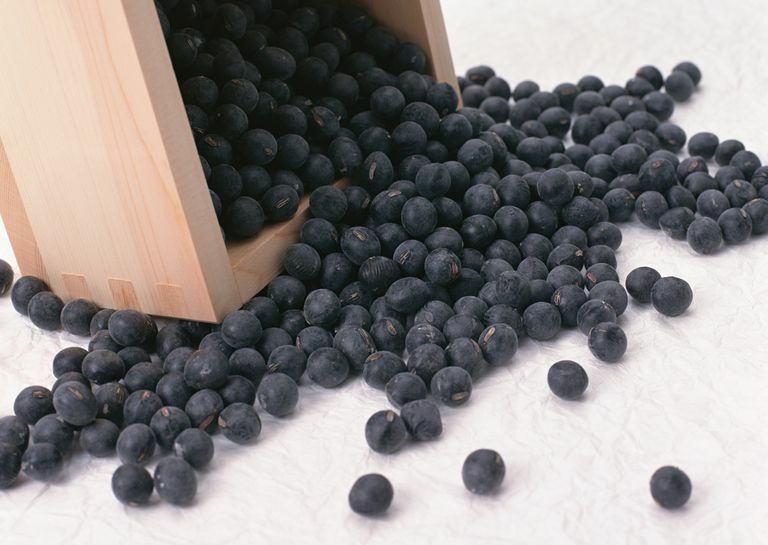 Similar to blueberries and raspberries, the dark exterior of the black soybean contains antioxidants that inhibit the oxidation of other molecules. Black soybeans are great substitutes for higher-carb beans, such as black, navy, and pinto beans. They don't taste as soybean-like as the yellow ones do, but rather more like regular black beans. You can substitute them in dishes that call for black beans, such as baked beans, refried beans, bean soup, chili, and 4-Bean Salad. Because of their delicate skin and silken texture, black soybeans need to be cooked a bit differently than regular beans. To avoid their getting mushy, it is best to soak overnight and cook dried black soybeans in salted water. You will use the same water measurements called for in recipes using regular beans, but be sure to add the salt (about 1/2 teaspoon). And whether you are using a pressure cooker or the stove top, when cooking black soybeans you will need to skim off the top a few times during the cooking process. After the beans have reached a boil uncovered, reduce heat to a simmer and skim off the whitish-gray foam on top. Repeat these three steps again. If while skimming you remove some beans, rinse them before returning them to the pot. Add some vegetable oil (and garlic and onion, if desired) before continuing to control the foaming while cooking. If you are using a pressure cooker, cook the beans on high for 20 minutes and allow the pressure to naturally reduce for 10 to 12 minutes. If you are cooking on the stove, cover and cook for 1 1/2 hours until tender, adding more water if necessary. You can substitute black soybeans for other beans in recipes to create lower carbohydrate dishes. For example, black soybeans can stand in for navy beans in a barbecue beans recipe. Try using black soybeans in your next bean dip recipe. Or, instead of the traditional pinto beans, replace with black soybeans in your refried bean dish to create a lower carb Mexican classic.